I continue to work and write to explore roads like this, too. “The No Shock Zone may have saved my life! I never heard of a ‘hot skin condition’ until I read about it in the No Shock Zone section of RV Travel. When hooking up last year I received a slight shock when I touched my travel trailer. My rig was fairly new and I was quite alarmed. After no avail trying to figure out what might be the problem, I was lucky enough to get a mobile RV electrician to come out the afternoon of July 3rd! If you don’t know what a hot skin condition is, then you must read Mike’s RV Electricity Newsletter. It’s a topic that comes up often (read the latest issue here). Hot skin conditions kill adults just as easily. RVs DON’T LOOK MENACING. We buy them and assume everything will be fine. For example, we don’t even think about a fire, yet type “RV fire” into YouTube and see what comes up! And how about drivers who don’t know how to react if a front tire blows? If they react improperly, they could die. That’s why every so often we publicize this video from Michelin about how to deal with a tire blowout. Also, we remind our readers regularly about the dangers of carbon monoxide, and we publicize RV recalls within hours of when they’re issued so you can get any defects fixed right away. RVs are about fun. They’re about adventure. They’re wonderful for vacations and increasingly to live in full-time. RVs are amazing — modern-day magic carpets. Yes, I write about problems in the industry (and will stay on that soapbox), but I still love RVing as much as when I began doing it half my life ago. 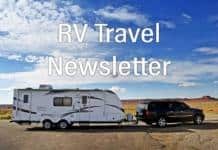 But for me, this newsletter, and our other newsletters and websites, are very much about educating RVers to buy more wisely and to be safe with them. That’s what gets me revved up every morning. Please tell your friends about us. Help spread the word. You can read us for free or you can become a voluntary subscriber and help put some extra fuel in our editorial tank. That’s your decision. Our decision is to keep producing quality information that lets you enjoy your RV more and do it safer. We’ll do that until our ink runs dry. But then there is no ink in cyberspace. So I guess we’ll just join the Energizer Bunny and keep on going and going and . . . Thanks for reading. You empower us. P.S. 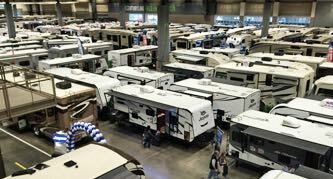 The next scheduled RVtravel.com get together will be at the RVillage Rally in Elkhart, Indiana, May 17-21. Please join us. Sign up at RVillage to learn more. The rally should be a great time. Gail and I would love to meet you there. Mike Sokol will be a guest for a taping of the syndicated radio program “The RV Show USA” this coming Wednesday, March 14, at 5 p.m., Pacific (8 p.m. Eastern Time). Watch the taping live on Facebook beginning then. The prize money for our Pot of Gold contest: A few of our voluntary subscribers have written asking why we are spending (wasting) money on the contest. Well, we are not. All the prize money is covered by sponsors and advertisers. We actually come out a few dollars ahead every day, which we put to good use. What we learned about you last week: We conducted a half-dozen reader polls, two in this newsletter and four in our Monday-Thursday newsletter RV Daily Tips. Here’s what we learned about you: for example, how many of you use a space heater in your RV, how long it’s been since you used a pay phone, how many of you listen to a radio station while driving, and more. Fun (and interesting!). Our Pot of Gold Contest has returned. Today’s cash prize is $106. If your official residence is in one of today’s randomly selected Zip or Canadian Postal Codes, you could win the daily cash prize. Click here to learn more about the contest and see today’s winning Zip and Postal Codes. New Zip and Postal Codes are posted every Monday through Saturday. Every day there is no winner, the prize money goes up by $2. Congratulations to Paul Richardson from Newnan, GA, who won $120 on March 6! Are alien bugs hiding in your RV? The United States and parts of Canada have been invaded by stink bugs that not only smell terrible but threaten the agricultural industry. The bugs can hide out in your RV for months, then appear hundreds, even thousands of miles away. In this story, which you will soon see in the major media, learn about the bugs and what to do when you encounter them. “They have followed us everywhere. We killed six the other day, in early March, in our park in Texas,” said RV Travel editor Chuck Woodbury. “I’ve wondered if they’re here in Texas or if we brought them along with us.” Read more. • Volunteer: Have fun, do good, save on camping fees. • Navigating parking lots with a big RV. • Care and feeding of your shore power connection – Part 3. • Electric power: You pay for it – learn to read the meter. The staff of RVtravel.com works hard to bring you an honest, unbiased, valuable newsletter every Saturday. Readers help make it possible with their “voluntary subscriptions.” Even a pledge of $5, $10 or $20 a year is appreciated — that’s for more than 50 weekly issues (add another 208 if you read our RV Daily Tips Newsletter)! Many readers set up an ongoing subscription, most $5 to $10 month. Your contributions make it possible for us to write about important matters, not just fluff to please advertisers and RV industry big shots. Enter a voluntary subscription. Use a credit card, PayPal or mail a check. The list of latest recalls on RVs and other vehicles and/or products of interest to RVers has been released by the U.S. National Highway Transportation Safety Administration. 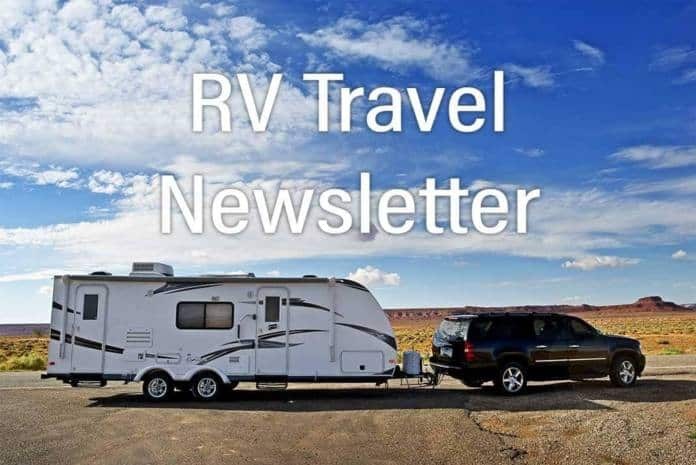 The list includes models from DRV Suites, Entegra, Forest River, Gulf Stream, Jayco, Keystone, Lance, Newmar and others — plus other vehicles commonly used by RVers and some tires. Is your RV, other vehicle or type of tires on the list? Find out here. • Keystone recalls trailers for improper GFCI receptacle. • Thor recalls RVs for sofa seat belt design error. • Forest River recalls toy haulers for wrong safety chains. The revolutionary Truma AquaGo® hybrid instant water heater provides instant, constant and endless hot water. It is the only water heater that can be decalcified to extend product life to maintain performance, replace any 6-16 gallon water heater and the “Easy Drain Lever” makes winterization simple. Make an appointment to upgrade your RV at a Truma Sales & Service Center or find your closest dealer here. Most travel trailer owners have their propane cylinders mounted up-front, right on the trailer tongue. While that makes for an easy access for refilling, it can also make for easy access for people with bad intent. Our long-time reader Tommy Molnar provides us with a security mod he uses to keep his LP cylinders from walking off. Learn more. Okay to level with one wheel off the ground? Here’s a question that sometimes pops up: When leveling, is it okay to get a wheel or wheels off the ground? It’s another one of those loaded questions, with people lining up across the fire pit, shootin’ irons ready to blaze. There are valid concerns about raising a motorhome’s tires off the ground, including parking stability or even having the windshield pop out. Learn more. Russ and Tiña De Maris rarely stay at an RV park, and their recent nightmare experience, from start to finish, has reminded them why not. You won’t believe this horror story! Read more. Do you know what to do if your RV or tow vehicle blows a front tire? Slam on your brakes? No, don’t do that or you’ll risk going out of control, being badly injured or off to your next life. This video from Michelin shows you what to do in such a situation, and why to do it that way. Watch it. Then watch it again. And then tell your friends and family to watch it. Really, watch this video! Which TOP THREE of these amenities would you prefer most at an RV park? Would you prefer speedy WiFi, great cable TV, lots of space between sites …. or ?? After you click your responses, you’ll see how others have responded. Feel free to leave a comment. We’ll post the final results in next week’s newsletter. CLICK HERE. What’s the fairest checkout time at RV parks? Click here for the results. Gardening for RVers? Yup, right on your bumper! One thing Tiña De Maris missed when on the road was a garden. Sure, you can put a potted flower on the dinette, but it’s just not the same, and vegetables don’t always lend themselves to a little bitty pot. Russ, being the supportive hubby that he is, not to mention fresh fruit and vegetable lover, constructed the ultimate traveling garden: the RV bumper garden. It’s not too difficult, and maybe you can have one too! Learn more. Faded and cracked decals got you down? Make new ones! Rich “The Wanderman” sees many posts on online forums about faded and cracked decals. His 1991 Aero Cruiser has straight decals going most of the way around it, and parts of them look awful. He’s been wanting to replace them and perhaps add some unique touches in various places. The trick is, how do you get it done? He explains here. Excess moisture is not something you want in your RV. It can lead to rot, mold, mildew and nasty odors. Gary Bunzer, the RV Doctor, gives advice about how to prevent and control excess moisture in an RV, as well as ways to prevent odors associated with excess moisture. Watch the video. Rats eating the wiring in your car? RV? The Weekly Driver reports that vehicles parked outside and near trees are literally being eaten by rats! At least their wiring. “Owners of cars from several manufacturers are increasingly reporting that rats and other rodents are eating their vehicles from the inside out,” the website reported. Why is this occurring more frequently? Find out here and participate in a quick poll. Make foul smelling odors a thing of the past! Already used by major RV manufacturers, the revolutionary HepvO waterless trap is a fantastic alternative to a conventional ‘P’ trap and it won’t fail due to evaporation, movement, freezing or leakage. Its unique membrane prevents foul air from the grey water tank entering your RV and its in-line design helps create extra storage space! Learn more. Thor, the largest RV maker in the world, is shifting its focus from Baby Boomers to Millennials. That’s what company CEO Bob Martin told Jim Cramer last Thursday on Cramer’s CNBC TV show “Mad Money.” “It’s all about Instagrammable experience,” Martin said. Read more. Why are my RV batteries drying out? Chris Dougherty, certified RV technician, received this question from a reader while he was serving as RVtravel.com’s technical editor: “I have a 50-amp transfer switch. My question is if the power from the converter/charger goes through the transfer switch? I’m boiling batteries and trying to determine if the converter or transfer switch is bad, or none of the above?” Read Chris’ answer. How many fire extinguishers in your RV – two? three? Is it really necessary to carry more than one fire extinguisher in your RV? Mac The Fire Guy offers advice about the need for more than one fire extinguisher in your RV. Watch the video. Some snowbirds like to stick it out in the desert until the increasing heat thoroughly thaws out their bones before moving north. However, some spring days can easily reach into the 90s and if you are boondocking, running an air conditioner from your main engine or a generator for hours may not be an option. There are two effective methods to control your interior heat. Learn more. Caravan’s highly concentrated, bio-enzymatic formula is guaranteed to remove the debris causing your tanks to misread. No driving necessary. No dangerous chemicals. No strong odors. Perfect for full-timers and permanently parked RVs. Learn more or buy at Amazon.com. • RV Electricity: What’s “the Code”? Find out here. • Astronomy for RVers: Catch a shooting star. • Advance technology boosts power inverter capabilities. • What’s the fairest checkout time at an RV park? • RV owner stymied by stuck-out step. • Video: Building the first 3-D printed RV. • Adding storage in RV’s dinette seats. • Visit the OK Corral ghosts at Clanton Ranch. • Desert wildflowers are already beginning to bloom. • Hubby wants to be navigator, but forgetfulness causing issues. • Can I run my LR-E at 65 psi, or is this overloading the tire? Eighty percent of the original Route 66 is still easily drivable, but often not on ordinary maps & signage. The EZ66 GUIDE is the answer to finding the route, most of it suitable for RVs. This is the ultimate guide for exploring the Mother Road whether you’re driving west or east. Its maps & directions are comprehensive yet easy to follow. Highly rated. Learn more or order. RVs today are being built fast, and in many cases poorly. Here are some examples. ‌Fiesta Key RV Resort & Marina is Open! Stay in the heart of the Florida Keys, where you’ll discover lush greenery and embrace the tropical feel of our 28-acre resort located on an island all our own. We are surrounded by incredible Gulf of Mexico ocean views, have an on-site marina, and plenty of areas where you can relax and enjoy the sunset. Learn more here. Regular unleaded gasoline: $2.56 (on Mar. 5). Change from week before: Up 1 cent; Change from year before: Up 22 cents. Diesel: $2.99 (on Mar. 5). Change from week before: Down 2 cents; Change from year before: Up 41 cents. Seven out of ten RV Travel readers travel with a pet (see our reader survey). Here’s a weekly dose of helpful information from our resident veterinarian. What are heartworms and should I be concerned about my dog and cat having them? Read Dr. Deanna’s reply and take a quick survey! If you take a daily vitamin your dog should too! Dogs need all the right vitamins and minerals to stay healthy, just like us humans. If your dog doesn’t get a wide variety of foods, consider giving Fido a daily vitamin. This 5-in-1 multivitamin chew supports your dog’s hip and joint health, heart health, skin and coat, digestive system and immune system. Keep Fido healthy, happy and energized. Learn more and order here. Does your motorhome or camper van have a rear window? Do you rely on it when backing up? If so, with a Fresnel lens your view of what’s right behind you will vastly expand, helping you avoid hitting objects, even a child or other person. If your RV is about 24 feet or less with a rear window, this inexpensive device could keep you out of trouble. Learn more or order. Here are two possible solutions for slippery cushions. Apply “lines” of silicone caulk in a pattern across the “back” of the sliding cushy. Let the caulk dry before setting back into place – the dry caulk acts as a snubber. Or attach sticky-back hook-and-loop tape to both the cushion and the surface it should “stick” to. Time to open your awning? Sometimes the awning pull loop at the end of the strap can be hard to find. Get a large, colorful carabiner like those used by climbers and sailors. The “snap lock” hardware makes it easier to find the end of the strap, and you can grab it with your awning hook. Find them at outdoor stores, ship chandleries or at Amazon.com. Do you have a Quick Tip? Send it to Diane (at) RVtravel.com and you just might see it here. Attention desert rats, toy haulers, and all owners of ATVs and side-by-side vehicles. This may be the rugged performer tire you’ve been looking for, a performance racer-tested tire approved by the Murray Brothers team. The Carlstar Group announced on March 7 the release of the new ITP-branded Coyote tire for high horsepower UTV vehicles and SxS’s. The 32-inch, 8-ply rated radial tire is compliant with DOT testing standards and is made in the USA. Learn more. Few add-ons are more enthusiastically endorsed by RVers as MaxxAir vents. This is the original and best-selling model. Install this over your RV vents, then keep them open in any weather. On rainy days, air from inside your RV can exit without a single drop of rain coming inside. Keep your vents open during storage and while driving. Learn more or order. How often do you have to recertify propane tanks? Read the rest of the question and Bob’s (very thorough) response. Read the most recent BoondockBob Blog post: How to find great and plentiful boondocking campsites. Reducing hot-skin shocks – Are we there yet? Read the rest of the comment and Mike’s response. No~Shock~Zone seminars coming to a town near you. How would I set inflation on a smaller single axle trailer? “Our Jayco Hummingbird came from the factory with P235/75R15SL tires. The TT GVWR is 3,750 lbs and the GAWR for the axle is 3,500 lbs. This is a single axle TT. The P-rated tires were like a pogo stick at max inflation. …” Read the rest of the question and Roger’s response. From the earliest days of “motor camping,” (that is camping with motorized vehicles either to drive or to pull a trailer) driven RVs were known as “house cars.” Read more here. Al Hesselbart is the author of “The Dumb Things Sold … Just Like That!,” a history of the recreational vehicle industry in America. Sweet ‘n simple lump crab meat. Serve this saucy concoction over whatever comes to hand: cooked rice, pasta or noodles, crisp Asian noodles, steamed carrot sticks or cabbage wedges, toast, polenta, waffles, pancakes, corn muffins. The sweetness of the corn combines with the sweetness of fresh crab meat to complete an RV feast that tastes like delivery from a gourmet restaurant. Get the recipe. OK, I’m cheating a little bit here. This isn’t one of your recipes. This is one of my favorite recipes, written by one of my favorite vegetarian bloggers. I’m only cheating because I felt like sneaking in a meat-free recipe loaded with vegetables was probably what we needed after a long winter full of lots of meat and maybe fewer vegetables. Am I right? Read more and get the recipe. Fresh citrus? We’ll take it! Want to spritz your salad with fresh lemon? Spray your fish tacos with fresh lime juice? Yes, please! No need to buy lemon juice from the store (because who knows how long it’s been there!) This citrus sprayer is simply pushed into any citrus fruit and voila! It’s as easy as one, two, spray! Impress your guests with this neat gadget. Learn more or order here. When Chris and Jim Guld, Geeks on Tour, traveled for a month thru Italy and Croatia last summer, the only computer Chris took was a Chromebook. She was asked for a report on how it worked out, and here is her rave review. Learn more. … from Geeks On Tour. Here are two recent webcasts: #137. Accounts – do you have them set up right on your phone? and #136. Editing photos with Snapseed. Watch live or archives of past programs. • River Vista RV Resort. • RV Spring Cleaning with Non-Toxic Products. The Traxion Tailgate Ladder is easy to install on pretty much any truck. It provides a nearly universal fit, deploys in a couple of seconds and greatly reduces the strain of getting into the back of a truck. When not in use the tailgate ladder folds and secures neatly against the tailgate, out of the way of valuable cargo space. Heavy-duty construction ensures durability. Learn more or order. The Ramblin’ Pushers annual maintenance session with more than 100 scheduled seminars is scheduled May 3 to 9 at the Elkhart Indiana County Fairgrounds. It’s focused on maintenance and operation of diesel motorhomes and is open to all REV brand diesel motorhomes (American Coach, Beaver, Fleetwood, Holiday Rambler, Monaco, Safari, and Renegade). For more info or to register click here. Send your get club gathering information to chuck (at) RVtravel.com. No more than 60 words, please. Eliminate hose crimping at the faucet! Sometimes it’s a real pain hooking up your hose to a faucet or to your RV. This Camco flexible hose protector is the answer. Its easy gripper makes attaching the hose effortless. It’s compliant with all federal and state low-level lead laws, too. Every RVer should have one or two of these. Super low price, too. Learn more or order. Duncan Hines was a real person. He was an American pioneer of restaurant ratings for travelers who also wrote a book of hotel recommendations. “The more people I meet, the more I love my dog.” Thanks to Stewart Dearing (and Mark Twain)! Billboard seen on I-10 for a towing company: “THE BEST HOOKERS IN TOWN!” Thanks to Howard Schiller! I’ve just taken up speed reading. Last night I did “War and Peace” in 20 seconds. I know it’s only three words, but it’s a start. It’s tempting to let your kids have the run of a motorhome while you are driving down the highway. But if the rig were to stop very fast, the children could be thrown violently. So make sure children (and adults, too) are buckled up at all times except when making a quick shift to a new seat. That was a great video explaining how to handle a blow-out. Thank you. It makes total sense what they say to do but I would have never thought to accelerate to maintain control. Really appreciate you sharing that video! Hi, like the more healthy crab recipe. More like that would be welcomed. We have been Passport America members for quite some time and have never had a problem like the writer encountered! Of course, considering it is located in California, well, you can assume anything! We most likely will never visit that state again. Was there in the 60’s and I can only imagine how it has evolved since then. I just spent 2 months boondocking in California. Gasoline is over $1 per gallon more than in Arizona, sales tax is 8.25%, plastic bags at store checkouts that are free everywhere else cost 10 cents each. Ugh! Regarding safety belts for children and adults in the cabin of a motorhome. People should also consider stowing objects that they leave on the counter tops along with coffee/end tables, chairs, recliners and any other item not bolted down. A panic stop or crash can cause all of these thing to come flying towards the front of the coach where the driver and passenger can be the target. Not good. Every Rv should have a ground hookup. Most power problems are because of a bad ground. A ground rod by the sewer? Actually it would be easy to install a ground detector right with the tank messenger, red for bad ground, green for good or whatever. John, it’s not quite that simple, but for years I’ve been proposing a built-in NCVT (Non Contact Voltage Tester) that would alarm you of any RV hot-skin condition. So far no traction, but I keep trying. I missed the poll on rving abroad. When my husband was posted to the American Consulate in Frankfurt, Germany we shipped a pop-up camper and rved all over Europe. Had great experiences. Even camped with gypsies in Belgium. Now that must have been cool! My kind of trip. Need to write a book on that one. Would love to read about the gypsy encounter. O how fun. On the beverage question, I start my day with a small bowl of oatmeal squares & skim milk, nothing separate to drink, so I guess my answer is milk, sort of. Your publication is a real downer. I’m out. Its great to inform people about RV safety issues. Especially in getting the information out to the new and less informed RV buyer. I remember when I bought my first trailer, I bought it because it looked good and it served my camping needs. I had no clue of anything else. I.E. air pressure, electrical, batteries, towing requirements, weight distribution, etc. All that was after I started using the camper and learning about everything as I went along. I love your newsletter; I just wish now were I can find a good storage place for my camper. Amazing! How the writer came to this conclusion is beyond me. This such great source of rving information. Ifinite? I have told a lot of fellow rvers about this great source of usfull, even life saving information. We live in Ennismore, Ont., just outside Peterborough and about an hour and a half northeast of Toronto. Saw a sign for a local plumbing company “If we were not here, you would have no place to go.” Pretty funny!